The bandwidth is the traffic between our servers and users which are viewing your video and it resets every month. The Turbo Bandwidth is much better than the regular one, which means your videos will be streamed at higher speed (faster buffering). Please refer to the article "Regular vs Turbo Bandwidth" for streaming performance examples. Access to Turbo Bandwidth CDN video delivery will only be available for ENTERPRISE license accounts. This means that your videos are being processed and are loading much faster than our standard delivery. Everyone can still use the regular bandwidth which is unlimited and used basically in everyday web surfing. The difference is that the Turbo Bandwidth delivers the content much faster. Please note that Turbo Bandwidth is only being used if you are uploading your videos directly to vooPlayer and it uses the latest technology in Content Delivery Network. Each time someone is watching videos that are being hosted on vooPlayer they are using your Turbo Bandwidth. 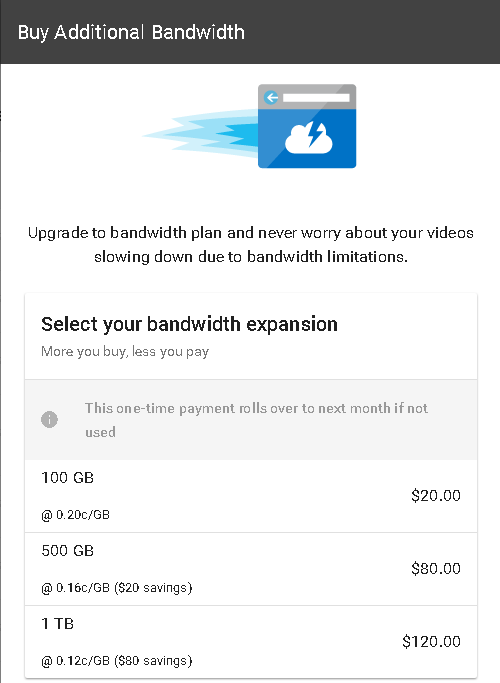 Enterprise v4 accounts now have 200 GB of Turbo-Bandwidth each month. PRO accounts will not have videos delivered via CDN with Turbo bandwidth. These are delivered via our standard servers. 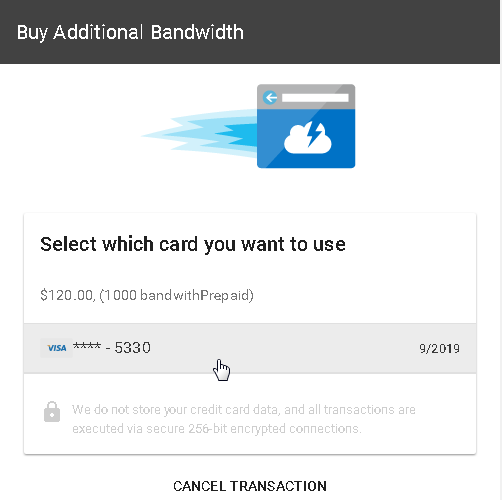 Also you can purchase additional bandwidth by clicking "Buy Bandwidth". From there, you can choose which plan you would like to purchase. Clicking on any of those options will bring you a purchasing menu where you can confirm an already entered credit card or add a new one. 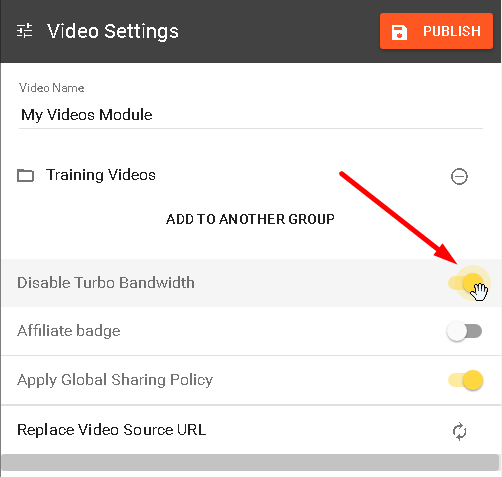 Turbo Bandwidth can also be disabled for specific videos. To do so, just open any video from your Dashboard and follow these screenshots. 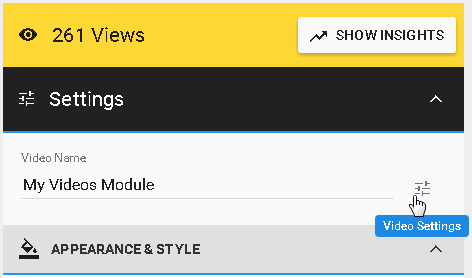 Do not forget to PUBLISH your video to apply the settings.